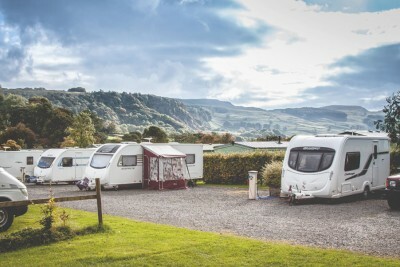 Nestled in the hills of the North Yorkshire Dales and running along the banks of the beautiful river Ribble, near Settle, Knight Stainforth Hall Caravan and Camping Park is the perfect rural getaway. It’s been in the Maudsley family for three generations and with the recent addition of a beautiful stone built restaurant, cafe bar, reception and shop which sits overlooking the site and the rolling Yorkshire countryside, it really is worth a visit. Set in the small village of Little Stainforth, the market town of Settle is a nice walk away, either along the river or on the country tracks. 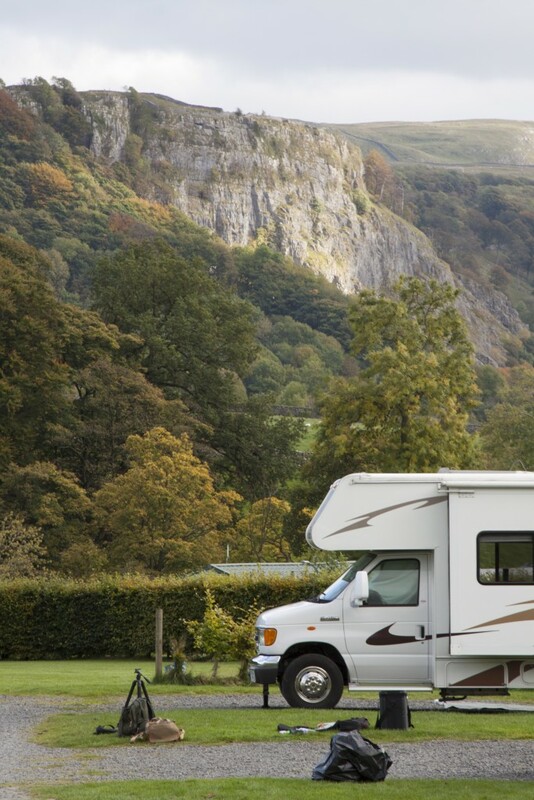 But there really is no reason to leave the campsite, where you can relax and take in the magnificent scenery. But for those who do want to go off and explore, there are plenty of walks, activities and sights to see throughout the Yorkshire Dales National Park. We were at Knight Stainforth to film our customer videos and received the warmest of welcomes from owner Paul, his brother Chris, and their young family. First impressions count, and with its relaxed atmosphere, easy going staff, absolutely stunning location, we knew we were on to a winner for our backdrop. But, the best was yet to come – the ‘piece de resistance’ was the mouth-watering food, with meats reared and supplied by local farmer, who also happens to be Paul’s other brother! 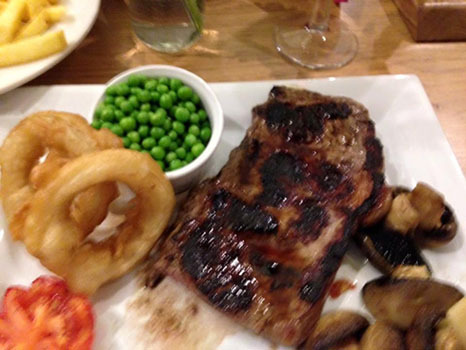 Not only is the food at the on-site ‘Knights Table’ restaurant delicious – it’s very reasonably priced too, and can all be washed down with a local brew of beer or tea. In fact there’s a whole menu dedicated to tea! It really is a family affair and it was lovely to sit and talk to Paul about how his grandparents diversified from farming into tourism in the 1920s by setting up a summer camp for a scout group. In fact next year they’ll be celebrating their 90th anniversary – which I’m sure pyrotechnic Paul will have big plans for! Her 10-year-old sister Isabel would also recommend the campsite for its “tender meats and range of marvellous and crazy teas!” She was also impressed to hear how head of the Scouts’ Association Bear Grylls had jumped into the nearby fast flowing river! Fishing is available on site as long as you have a valid licence and in early October salmon can be seen jumping up the river! Other facilities at the site include a games and TV room, children’s play and ball game areas and an information room with brochures and maps of nearby activities. 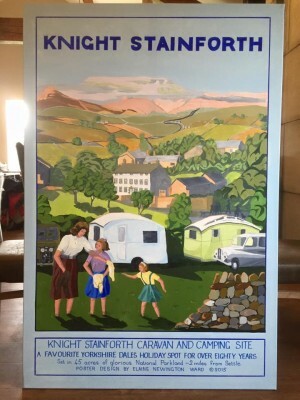 Knight Stainforth’s touring park is open from March 1st to October 31st and has 100 pitches for caravans, motorhomes and tents – 75 have an electrical hook-up. 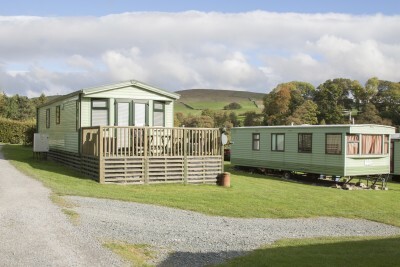 There are also 60 fully serviced holiday homes which all have unique views of the surrounding countryside. The holiday park is open from March 1st to January 14th. 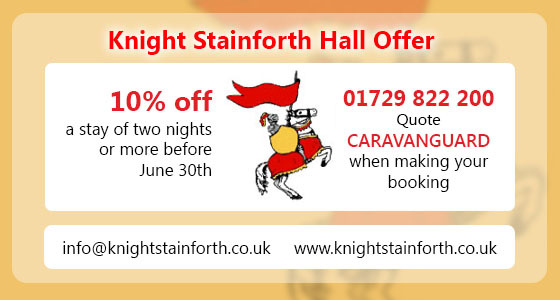 For more information or to make a booking call 01729 822200, email info@knightstainforth.co.uk or visit www.knightstainforth.co.uk. Use the code ‘CARAVANGUARD’ to get your discount. I only live six miles away, so not worth getting the camper out to just go that far. For train enthusiasts, they run on Wednesdays and weekends through the summer. If you are into fell walking, the Three Peaks are close by. A good challenge, 28 miles in 12 hours, I think nowadays, to get the badge. It was tough years ago, but paths have been laid now in places. The nearest hill to the campsite is Pen-y-Gent. It is a circular walk, so park the car in Horton in Ribblesdale and collect when you return. No need to catch a bus back to it. If anybody watched the series, Jerusalem, on TV recently, you can see the Ribblehead Viaduct that the program was based around. I could go on, but of course I am biased, living there. Thanks for sharing that extra information Ron – very informative. 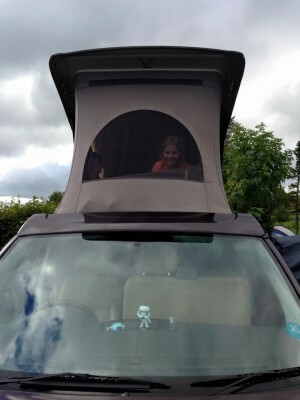 Can I ask are the caravan electric pitches hard standing and can you also use an awning (again on hard standing). The majority of pitches are hard standing and I believe you can use an awning. If you give them a call on 01729 822200 or drop them an email: info@knightstainforth.co.uk they will be able to confirm and answer your questions. Is there any fully serviced pitches, are dogs welcome in the touring park (and in the holiday homes for non owning friends) and how far to walk to nearest pub etc? The majority of pitches have electric and water, but no waste facilities. Dogs are welcome on the park, providing they are kept on a lead. And the nearest pub is on site – The Knights Table. The next nearest pub is about a 10-15 minute walk. Fantastic campsite, we had a great time when we were there with the Caravan Guard team! Thanks Brett. It was great to meet you and your family. You didn’t mention that it’s very close to the Settle to Carlisle railway line, generally believed to be one of the most spectacular in the country. If you’re really lucky you’ll see a steam train. They use it regularly during the summer for day trips! Yes you’re right Paul – sorry about that. We were lucky to see a steam train pass in an earlier visit!